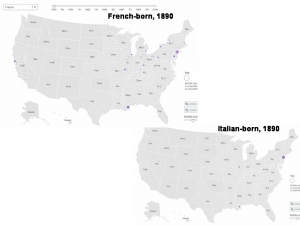 A few years ago, the New York Times published a fascinating interactive map depicting where various foreign-born groups have settled in the United States over the years. Immigrants are categorized by country of birth, with the colors representing countries or regions of origin, such as Canada (green), Western Europe (purple), Asia and the Middle East (orange), Latin America (maroon), Russia and Eastern Europe (blue), and Africa (magenta). The shades of color represent the percentage of the total population that belongs to the largest immigrant group in a given county. Some of the most obvious patterns are unsurprising. The largest percentage of immigrants is found in areas close to the Mexican border, in southern Florida, in the West, as well as in large cities such as New York City, Chicago, Atlanta, and Washington D.C. Latin Americans predominate in the states that border Mexico as well as in Florida. Canadians tend to settle along the Canadian border. Asian are the largest immigrant group in Hawaii. The same is true of most of Alaska, except for Southeast Fairbanks Census Area and Matanuska-Susitna Borough, where immigrants from Russia are most numerous. The interactive nature of this map allows one to see some other interesting patterns. For example, one can toggle between “Percent of population” (as in the map above) and “Number of residents” (as in the map on the left). 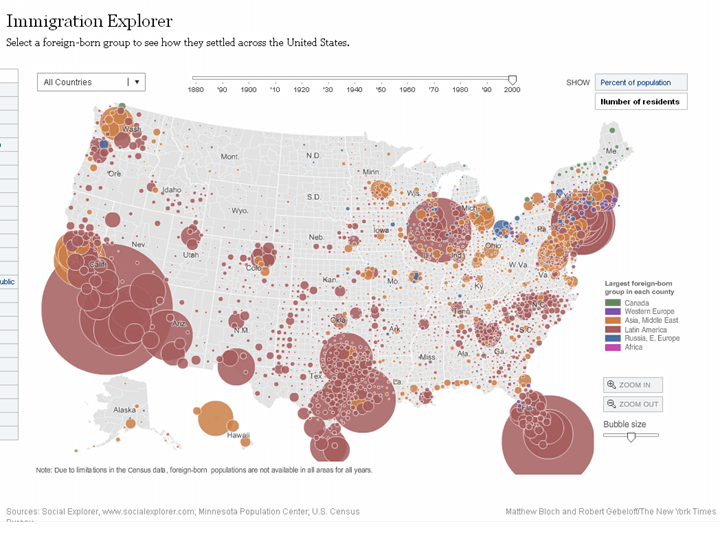 In the latter version of the map, the bubble size represents how big a given immigrant group is in absolute numbers. The prevalence of the Latin American-born population is clearly evident in this map. However, it is also possible to discern other groups that are masked by the large Hispanic presence in the “Percent of population” map, such as the numerous Asian-born immigrants in California, Washington and the Mid-Atlantic area. While Russians constitute the largest immigrant group in several parts of Alaska, the actual Russian-born population there is quite small. Much bigger communities of Eastern European-born immigrants are found in Cuyahoga County, Ohio, where Hungarians constitute 3.1% of the population, Slovaks 3%, Russians 1.7%, Czechs 1.6%, and Ukrainians 1.2%; Clark County, Washington, where Russians account for 1.9% of the population; and Oneida County, New York, where over 2% of the population are from the former Yugoslavia and Poland. George County, Virginia are mostly families of teachers working in inner-city and rural schools. But the largest Philippine-born communities are to be found in California and Hawaii, as well as in Chicago and Seattle areas (see the second map on the left). Polish immigrants live primarily in Chicago and the greater New York City area. 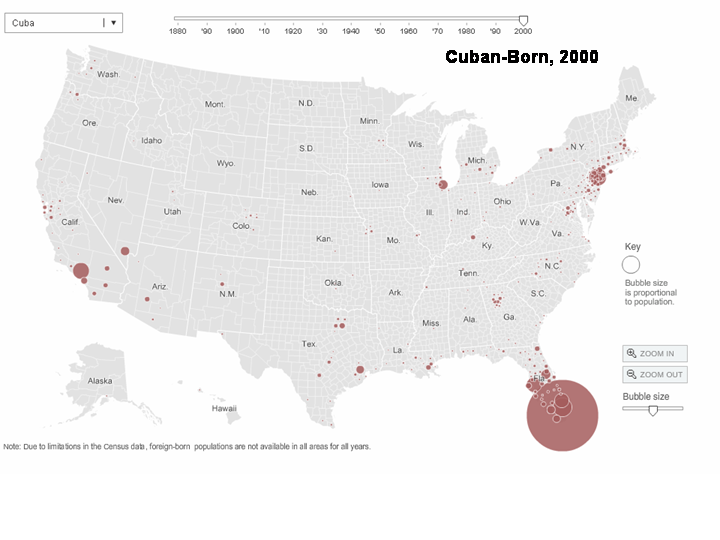 Cubans are settled mostly in southern Florida, with smaller communities in Southern California and New York City. Immigrants from the Middle East are found in largest numbers in and around Los Angeles, New York City, Detroit, and Chicago. One of the best features of this interactive map is that it allows one to see how spatial patterns of immigration have changed over the years, beginning in 1880. Unfortunately, the most recent data mapped are from 2000, as the “Immigration Explorer” was created in 2009, before the 2010 census data was available. Also not all census years are mapped for all groups. Nonetheless, the histories of various immigrant groups can be examined by comparing maps from different census years. For example, Norwegian immigrants first appear in the census data in 1890, at which time they resided mostly in the upper Midwest, particularly in the area extending from eastern North Dakota, through eastern South Dakota, Minnesota, northern Iowa, Wisconsin and the greater Chicago area. Much smaller Norwegian communities settled in San Francisco, Seattle, New York City, Philadelphia, and Boston. At the turn of the twentieth century, smaller Norwegian communities continue to appear away from the core Midwestern area, as increasing numbers of Norwegian-born immigrants settled along the Pacific Coast, and in Montana, Idaho, and Utah, as well as in Massachusetts. The Norwegian-born immigrant community continued to shrink in numbers and become more decentralized geographically throughout the 1920s and 1930s. 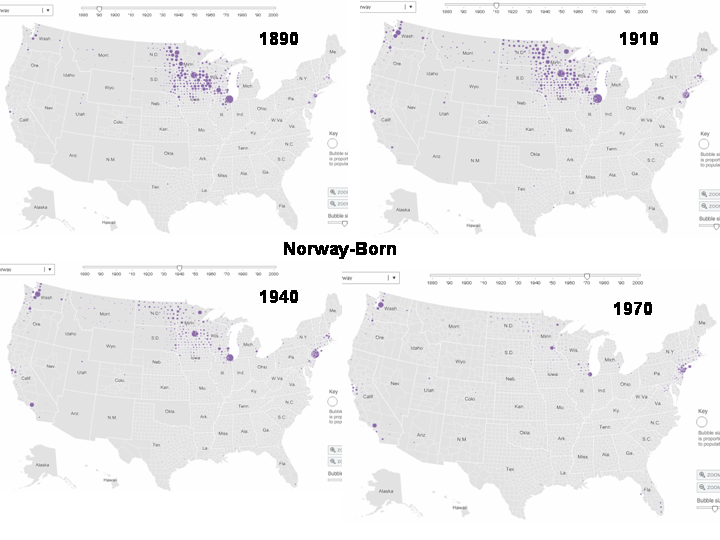 By 1940, most Norwegian immigrants lived not in small rural communities as they did in earlier years, but in large cities: Minneapolis, Chicago, Seattle, New York City, Los Angeles, San Francisco. These processes persisted during the post-World War II years, with the overall number of Norwegian-born immigrants continuing to shrink as immigration from Norway and other Western European countries was reduced to a trickle. By 1970, few of the original Norwegian settlements in the rural Midwest remained, as most Norwegian-born immigrants had moved to large cities. The story of the Swedish-born immigrants in the U.S. is similar, although Swedes started to settle in America a little earlier than Norwegians. Moreover, significant settlements of Swedish-born immigrants were established by 1890 not only in the Midwest, but also throughout Nebraska, Iowa, Kansas, and Colorado. Other Swedes settled at the time in Seattle, San Francisco, Pittsburg, and throughout southern New England. As was the case with Norwegian immigrants, Swedes continued to move from rural areas to large cities, and from the 1940s on the flow of immigration from Sweden continually decreases. Likewise, immigration from other Western European countries has decreased over decades. French and Italian immigrants also began to settle in the United States in the early years; however, their settlement patterns were quite different. Many of the French immigrants moved to Northern California long before 1880 (the first year mapped by the “Immigration Explorer”). Italian immigrants started to come to California in large numbers in the 1880s, and by 1890, a significant number of Italians had settled in the region. In 1886, the oldest continually operating Italian restaurant in the U.S., Fior D’Italia opened its doors in San Francisco. By 1890, German-speakers from Russia were joined by mostly Yiddish-speaking immigrants, most of whom settled in New York. In the next two decades, immigration from Russia continues apace, most of it still Jewish. Large communities of immigrants from Russia were established by 1910 in New York, Chicago, Pittsburg, Philadelphia, Boston, Baltimore, Cleveland, Buffalo, Detroit, Saint Louis, and the Twin Cities; their presence on the West Coast, however, remained minute. By 1920, the nature of immigration from Russia changed once again: at this time, ethnic minorities (Germans, Jews, and so on) were joined by the so-called “White Russians”, opponents of the Red Bolsheviks. Among them were aristocrats, officers of the Russian Imperial Army, members of the merchant class and the intelligentsia, priests, members of sectarian communities, such as the Molokans, Baptists, Dukhobors, as well as many Russian-speaking Jews who were fleeing the pogroms. Having lost everything in the chaos of war, such people believed that they would not be able to live under the Bolshevik regime. Many of these White Russians came to the West Coast, particularly to San Francisco, often by way of the Chinese cities of Harbin and Shanghai. As a result of this influx, the Russian community in San Francisco grew to some 10,000 in 1920s. By 1940, most immigrants from Russia/USSR had settled in larger cities, although quite a few smaller communities still dot the rural landscapes of the Great Plains states. In the 1940s and 1950s very few people were moving from the Soviet Union to the United States. Those who did come were usually families fleeing the horrors of World War II or otherwise displaced by the war. 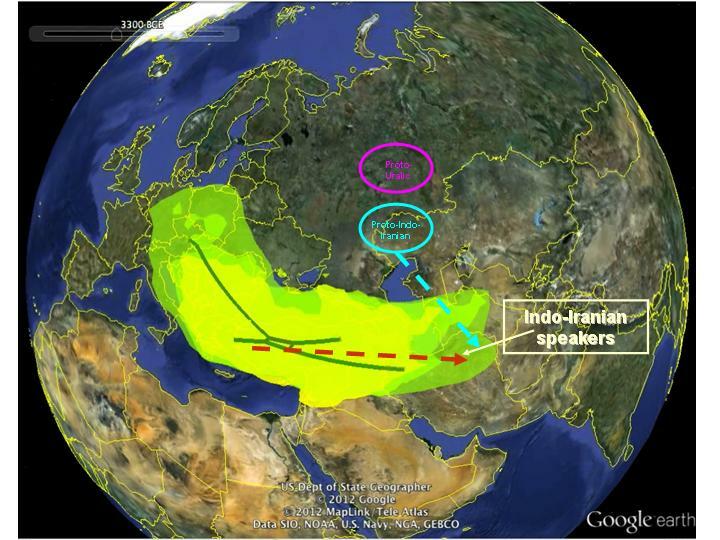 Among the former category was the family of Marija Gimbutas, a prominent archeologist known for her Kurgan Hypothesis of Indo-European origins. The Gimbutas family fled Lithuania in the wake of the Soviet re-occupation, first to Vienna and eventually to the United States. Other Soviet-born immigrants came from German concentration camps liberated by the Americans and the British. My great uncle, Misha (Mikhail) Pereltsvaig, who was a POW in Flossenbürg concentration camp, was offered a job with a large American oil company, but chose to return to the Soviet Union where his family remained. By 1960, the number of Russian/Soviet-born immigrants had dropped significantly. During the 1960s and 1970s virtually nobody was able to leave the Soviet Union, except a handful of dissidents who were sent out of the country or defected. Among them are Mikhail Baryshnikov, a dancer and choreographer who defected first to Canada in 1974 and then to the US. During the 1980s, more people were able to leave the Soviet Union, most of them Jews who immigrated via Vienna and Rome. Still, the number of immigrants born in Russia/USSR continued to shrink until 1990. 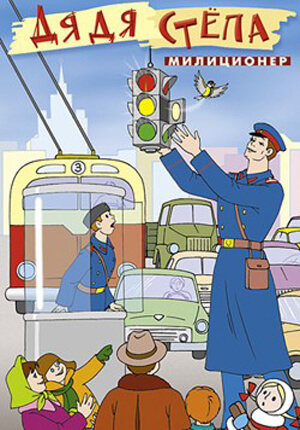 In the last decade of the twentieth century, however, the situation has changed dramatically; once again a new wave of immigrants from Russia and the former Soviet republics arrived in the US. Unlike the first immigrants from the Russian Empire, the Volga Germans, these later immigrants settle in large urban areas: New York, Los Angeles, San Francisco, Sacramento, Seattle, Portland, Chicago, Detroit, Boston, Philadelphia, Baltimore, Washington D.C., Dallas, and Houston. They also tend to gravitate towards university towns, for example, there is a significant Russian-born community in Yolo County, California, home of the University of California at Davis campus. Overall, immigration from Europe has given way to immigration from Latin America, Asia, the Middle East, and Africa. 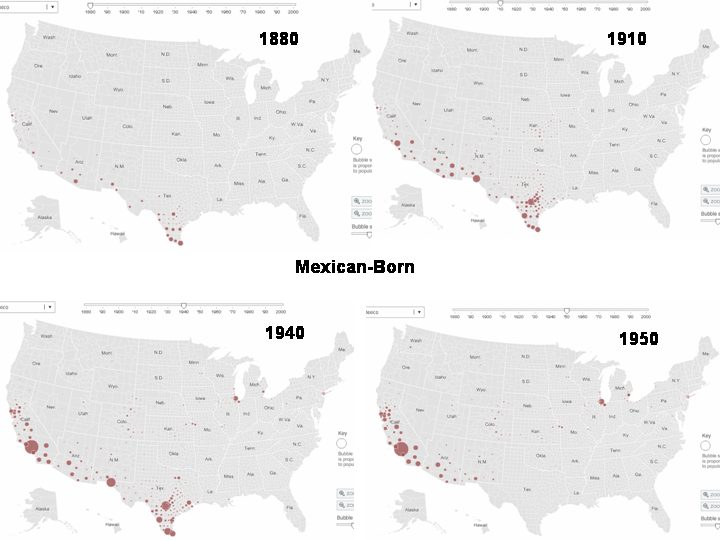 Immigrants from Latin America, particularly from Mexico, have come to the United States since the early years, and by 1880, significant Mexican-born communities were established along the border. Throughout the years, increasing numbers of immigrants from south of the border arrived in the US and moved deeper into the country, as can be seen from the maps on the left. In the 1930s and 1940s, Mexican immigrant communities appeared to retreat towards the border, but were also established in Chicago and other large cities, and by 1950 they virtually disappear from Texas. Yet, by 1960 this process had been reversed: Mexican immigrants settle again in Texas and throughout the country, and by 2000, Mexicans constituted the country’s largest immigrant group. Immigrants from Cuba also started to arrive to the United States in the early period, yet the numbers remained relatively low until the 1960s, when the anti-democratic nature of Fidel Castro’s regime became abundantly clear. Since then, Cuban immigrants have settled not only in southern Florida, where the largest Cuban communities can be found, but also in New York, Chicago, Los Angeles, and other large cities. In contrast, immigrants from Dominican Republic are mapped only beginning with 1980, when a large number of them settled in and around New York City. Smaller communities of Dominicans live in Boston, MA, Providence, RI, and Miami, FL. Immigrants from El Salvador are mapped by the “Immigration Explorer” only in 1990 and 2000. Unlike Mexican immigrants, El Salvadorians live mostly in urban areas, particularly in Los Angeles, San Francisco, Houston, Dallas, New York, Boston, Washington D.C., and Miami. Immigration from Africa is tracked by the “Immigration Explorer” only from 1970 on. Like El Salvadorians, immigrants from Africa tend to live in urban areas. Chinese immigrants started to arrive to the United States in the early period, yet initially they settled mostly in the West Coast states, and from 1900 also in Hawaii. Unfortunately, data for 1910-1960 is unavailable, but from 1970 on, Chinese immigrant communities were established in large cities throughout the country. Similarly, Japanese immigrants began by settling on the West Coast and Hawaii, yet the gap in the data from 1910 to 1960 does not allow us to track their history in detail. Likewise, immigration from Korea, Vietnam, and the Philippines is tracked only from 1980 onwards, and from India from 1970 onwards. As a result, little can be said about the historical-spatial patterns of these groups except the obvious: continuous growth and settlement mostly in large cities. 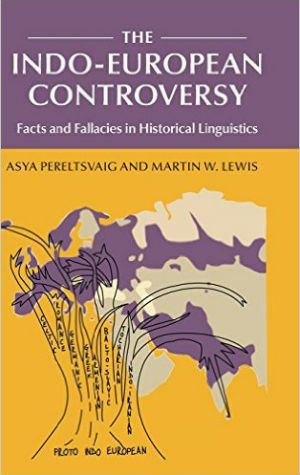 The last regional category “All Middle East” is also less than illuminating, although it is tracked from 1900 to 1940 and from 1990 to 2000. 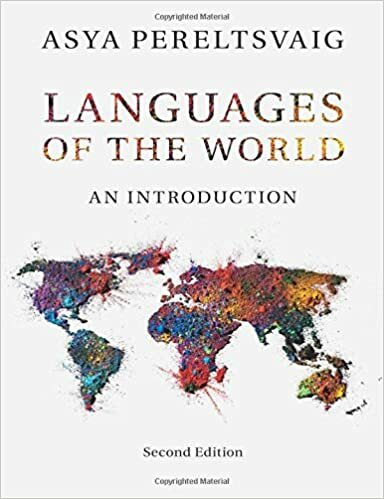 However, this category combines immigrant groups speaking many different languages that typically remained separate: Arabs from a large number of countries, Persians, Turks, Kurds, Israelis, and so on. Yet, despite the shortcomings mentioned above (missing data points, odd regional categories, etc. 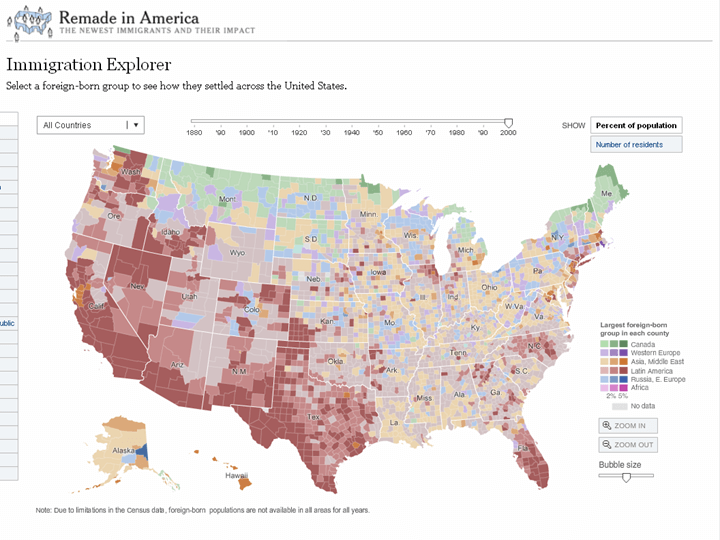 ), the “Immigration Explorer” is a valuable resource for scholars and teachers alike.